The Ghetto in Global History explores the stubborn tenacity of ‘the ghetto’ over time. As a concept, policy, and experience, the ghetto has served to maintain social, religious, and racial hierarchies over the past five centuries. Transnational in scope, this book allows readers to draw thought-provoking comparisons across time and space among ghettos that are not usually studied alongside one another. The volume is structured around four main case studies, covering the first ghettos created for Jews in early modern Europe, the Nazis' use of ghettos, the enclosure of African Americans in segregated areas in the United States, and the extreme segregation of blacks in South Africa. The contributors explore issues of discourse, power, and control; examine the internal structures of authority that prevailed; and document the lived experiences of ghetto inhabitants. By discussing ghettos as both tools of control and as sites of resistance, this book offers an unprecedented and fascinating range of interpretations of the meanings of the "ghetto" throughout history. It allows us to trace the circulation of the idea and practice over time and across continents, revealing new linkages between widely disparate settings. Geographically and chronologically wide-ranging, The Ghetto in Global History will prove indispensable reading for all those interested in the history of spatial segregation, power dynamics, and racial and religious relations across the globe. "Uncovering lines of connection and distinction stretching from Cinquecento Venice to apartheid Johannesburg via Nazi-controlled Bialystok and segregated Brooklyn, The Ghetto in Global History provides essential new insights into the making, remaking and unmaking of the ghetto as idea, social experience and technology of power." 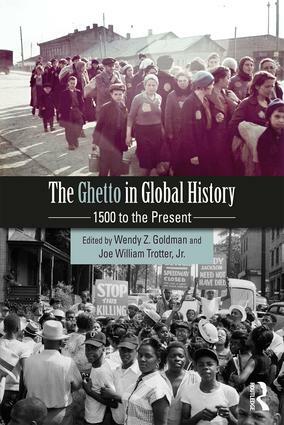 "Wendy Z. Goldman and Joe Trotter, Jr bring together many of the most important historians on ghettos in The Ghetto in Global History. The volume as a whole is an admirable attempt to breathe new life into the study of the classical tradition." Wendy Z. Goldman is Paul Mellon Distinguished Professor of History at Carnegie Mellon University, United States. She is a social and political historian of Russia, and her publications include Hunger and War: Food Provisioning in the Soviet Union During World War II (2015, ed. with Donald Filtzer), Inventing the Enemy: Denunciation and Terror in Stalin’s Russia (2011), Terror and Democracy in the Age of Stalin: The Social Dynamics of Repression (2007), and Women at the Gates: Gender and Industry in Stalin’s Russia (2002). Joe William Trotter, Jr. is Giant Eagle Professor of History and Social Justice and past History Department Chair at Carnegie Mellon University, United States. He also directs Carnegie Mellon’s Center for African American Urban Studies and the Economy (CAUSE) and is a past president of the Labor and Working Class History Association. His publications include Race and Renaissance: African Americans in Pittsburgh Since World War II (2010, co-authored with Jared N. Day), Black Milwaukee: The Making of an Industrial Proletariat, 1915-45 (second edition, 2007), and The African American Urban Experience: From the Colonial Era to the Present, with Earl Lewis and Tera W. Hunter(2004).